They closed down the old Bay Bridge over the long Labor Day weekend to disconnect it and open the new Bay Bridge that took twenty years to plan and build. After breakfast in Emeryville on Monday morning, we walked to Ikea, which is near the start of the bridge, and climbed up to their rooftop parking structure to get a look at the two bridges, which were both still closed. It’s kind of weird seeing them piggy-backed together like that. We could see where the old bridge had been cut off and barricaded which brought back memories of the big earthquake in 1989 that broke the bridge, leaving a car dangling. I was home sick with the flu when that happened, and remember lying in bed feverish, watching the video of the bridge breaking, the car sliding off, over and over. The new bridge opened to traffic Monday evening. On Tuesday they opened the bike and pedestrian lanes. You can only walk from the East Bay side to the central tower now, since they have to tear down the old bridge before they can complete the bike/pedestrian lanes all the way to San Francisco. 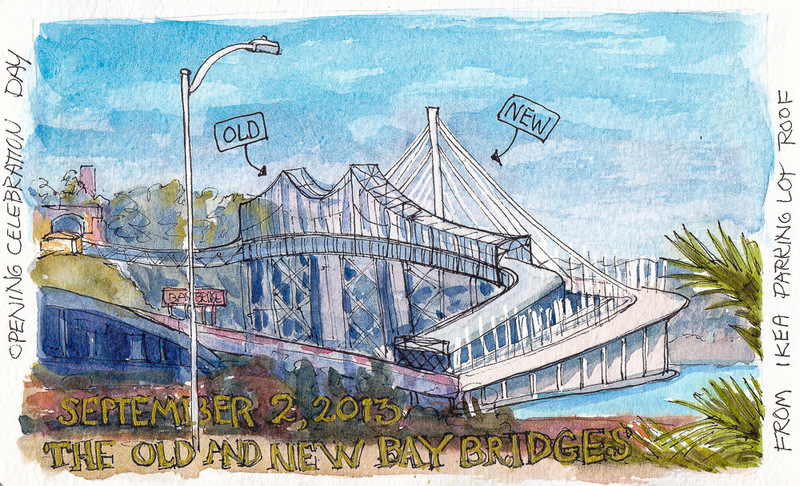 I’m plan to walk the 5-mile round trip soon, and sketch from the bridge. For this one I had to work from a photo because my breakfast buddy didn’t want to wait while I sketched, especially since we still had a long walk back to our car at the Doyle Street Cafe. I agree with annie, a very interesting perspective you have with both bridges there. Once again I think you live in a visually rich area! What an interesting moment in time you have captured.